Banbridge Town secured their second 0-0 draw in four days with another excellent performance against title contenders Annagh Utd in Portadown on Saturday. This point was the result of a wonderful work ethic coupled with a steely determination and will have once again pleased Manager Ryan Watson. 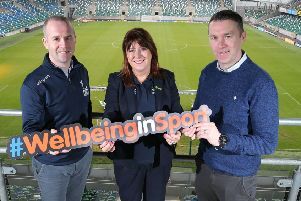 Indeed, it will also have delighted ex-boss Colin Malone, now in charge of League Leaders Lurgan Celtic, who are being pushed hard by Annagh in the title run-in. Although it was the physically stronger home side who had the territorial advantage in the first quarter, they failed to create any clear cut chances thanks to a very resolute Town defence in which Glen Waddell was immense throughout. Martin Buchanan continues to improve with every game and is thriving at present in his current midfield role. On 37 minutes McCann threaded a ball through to ace marksman Shea Campbell who was thwarted by a terrific stop from Town custodian Stephen Croft with Campbell lifting the rebound over. There was a good shape to Banbridge’s game and in the second half they upped the ante and took control away from the homesters. When a Michael Ferguson throw found Martin Buchanan the midfielder found Conor Downey who flashed an effort across goal. This was a warning to Annagh and after 59 minutes David Gray fired wide after being set up by Stevie Jones. Banbridge had a great chance to take the lead after 64 minutes when the quick thinking David Gray took a free which caught the home defence on the hop. He released Mattie McCartan and the Town Captain should have given his side the lead but finished poorly. Town did have a let-off in the 71st minute when Annagh’s Richard Allen rose to head a corner off the crossbar. However, Banbridge were soon on the offensive again and Conor Downey did really well to disposess Riddell after 76 minutes but after racing in on goal and indeed doing all the hard work, allowed Annagh keeper Fox to block his goal bound effort. It was a rousing final quarter and on 85 minutes a half volley from Buchanan scraped the bar. Two minutes later Town sub Mark Teggart wriggled his way through and curled a shot which Fox gathered after some difficulty. In the dying seconds Annagh had a great chance to secure victory when Philip Craig (ex-Portadown) cracked a tremendous volley from 35 yards which seemed destined for the top corner only for Stephen Croft to pull off a stunning save and secure a tremendous point for Town which stretches their recent unbeaten run to four matches. ANNAGH UTD: Fox, Bell, Riddell, Acheson, Allen, Craig, McCann, Park, Campbell, Gardiner, Stretton. Subs: Smith (Campbell 73), Rea, Brown (McCann 61), Nesbitt. BANBRIDGE TOWN: Croft, Wilson, Ferguson, Greene, Waddell, Buchanan, Gourley, McCartan, Downey, Jones, Gray. Subs: Coleman (Gourley 87), Hayes (Downey 78), Teggart (Gray 70), Stoddard, Watson.